Oh that question! It can get old very fast! HOWEVER, I believe the answer to this question can be life changing. I believe when you understand WHY something is done, meaningless work becomes uplifting and inspiring. Why do you do the things you do? Why do you get up early every morning? Why do you exercise? Why did you have kids? WHY keep running in the mayhem of your own life while still uplifting those around you? These are the million dollar questions. 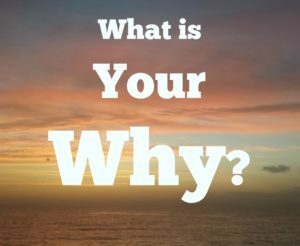 I recently came across a quote online, “If your WHY is important enough, the HOW becomes easy!” I’m going to change that just a little bit. “If your WHY is important enough, the HOW becomes EASIER!” Anything worthwhile is never simply just “easy”. It can still be very hard, but it is those times that make us stronger. If you understand WHY, then during difficult times when you want to give up, it will be the WHY that keeps you going. You must remember your WHY.